Most people do prefer a lighter look for the warmer months. If you tend to want to highlight your hair during the summer but prefer to steer clear of harsh chemical lighteners, there are a great homemade recipes that you can try. These recipes are using uses all natural ingredients so there is no damage to your hair. You just pick the color you want and give it a try. Before trying out these hair dyes, make sure your hair is clean. Henna is perfect for coloring hair. Do not use henna dye that has chemicals in it and which is black in color. Buy powder form of henna which is easily available in drugstores or online or cosmetics stores. Mix all ingredients in an iron bowl. Leave it for a night. Next morning apply all over dry and already shampooed hair. Let it work for 3 hours. Rinse only with warm water no need to be shampoo. After one day wash your hair with a good shampoo and condition. Make a thick paste with this above ingredients. Apply all over dry and already shampooed hair for 3 hours. Then wash with water and dry naturally. Next day wash your hair with a good shampoo and condition. Mix the above ingredients with tea liquor. Place this paste in sunlight for 1 hour and then apply it on hair with brush; when it gets dry then wash it with water. Next day wash your hair with a good shampoo and condition. take a small bowl of fresh Amla, paste and apply it on hairs ,wash after 2 hours. You can also take dry Amla powder if fresh Amlas are not available; the dry powder is easily available in the market. 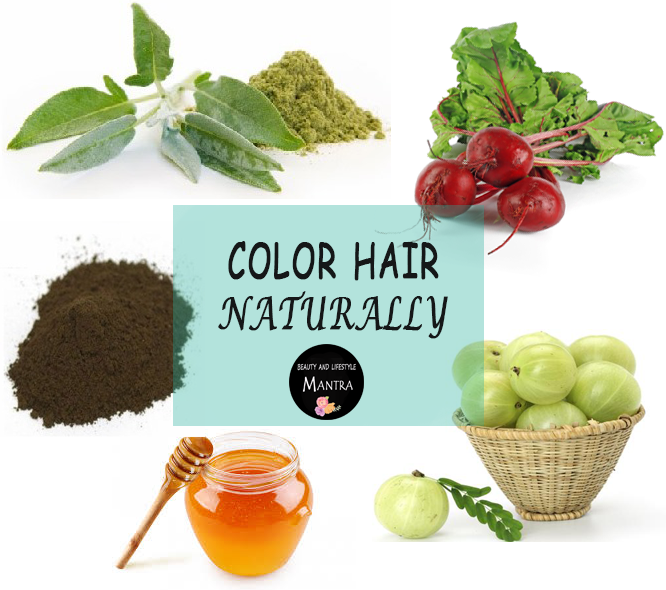 Make a thick paste of Amla powder by mixing some water and apply this paste on hairs for 3 hours and wash.
Honey bleaches your hair naturally so it is perfect if you want a lighter shade than your natural colour. Honey bleaches your hair and at the same time nourishes it. Take ingredients depending on your hair length. Add all the ingredients in a bowl and mix them well. Apply it and leave it on for at least 2 hours then wash. Do this only once a week. Coffee gives you red and brown highlights in dark hair. Prepare 2 cups of strong coffee. Wash your hair with a good shampoo and then put this mixture in a small tub and dip your hair in it. Rinse your hair over and over again with the mixture. Take the excess coffee mixture out and leave the rest in hair for 3-4 hours and then rinse with plain water. You should notice a few highlights after doing this 3-4 times. Finally, You can color you hair with Beet Juice or with Rhubarb Root or mix it together. These ingredients lighten your hair from honey brown to blonde or light brown. Take juice form ingredients and apply the juice mixture to the hair. The juice mixture should be left on the hair for at least 60 minutes.